Controlled climatic ambient conditions in laboratories and research institutes not only ensure dependable and reproducible results, but are also essential due to statutory requirements: high standards apply here for safety, health protection and environmental conservation. This must also be assured by dependable regulation and shut-off of volumetric flows of air. 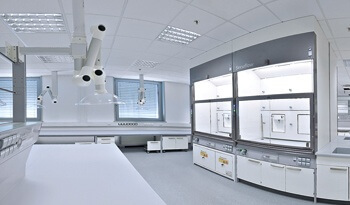 Ventilation systems for laboratory and measurement rooms usually have to meet particularly high requirements: health protection, hygiene, environmental protection, fire safety and comfort are just some of the aspects. In addition there may be problems with non-ideal structural factors and/or increased complexity due to there being several labs in one building. For dependable and reproducible results, precise compliance with often very narrowly defined temperature and humidity limits is also necessary. The fact that these ventilation and air-conditioning requirements in some cases run counter to one another makes the planning of HCV systems for laboratories even more complex. And finally the air-related systems in labs and research facilities have to meet economic criteria: Costs for investment, maintenance, servicing, inspection and operation are also crucial factors in times of heavy competitive pressure. With high-precision LTG components for air distribution, we ensure dependable control and shut-off of volumetric flows, and with highly inductive LTG air diffusers we also ensure the supply of fresh air and the removal of polluted air and thermal loads. Efficiently and dependably. Precision and safety take top priority when selecting products in laboratories and research facilities – including air treatment. LTG air distribution components meet all the requirements for dependable measurement, control and shut-off, also for aggressive, polluted or contaminated air. Constant flow rate controller are available complete in round (VRW) or angled Versions (VRX). For fresh air supply and for removal of thermal loads, LTG air diffusers in the form of highly inductive linear diffusers LDB (with LTG System clean®) or swirl diffusers DLA and special diffusers are also used in addition to LTG air-water Systems. LTG System clean: In LDB linear air diffusers, a narrow air screen flows along the ceiling to prevent soiling and to minimise renovation and cleaning costs.